June 25, 2013 By This post may contain affiliate links. 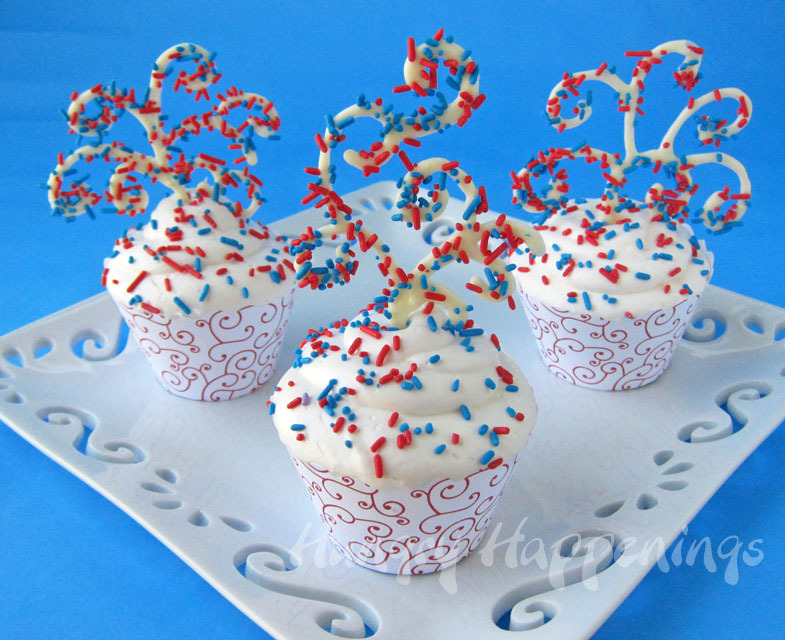 Make these Sprinkles will Fly Patriotic Cupcakes for a spectacular 4th of July dessert! 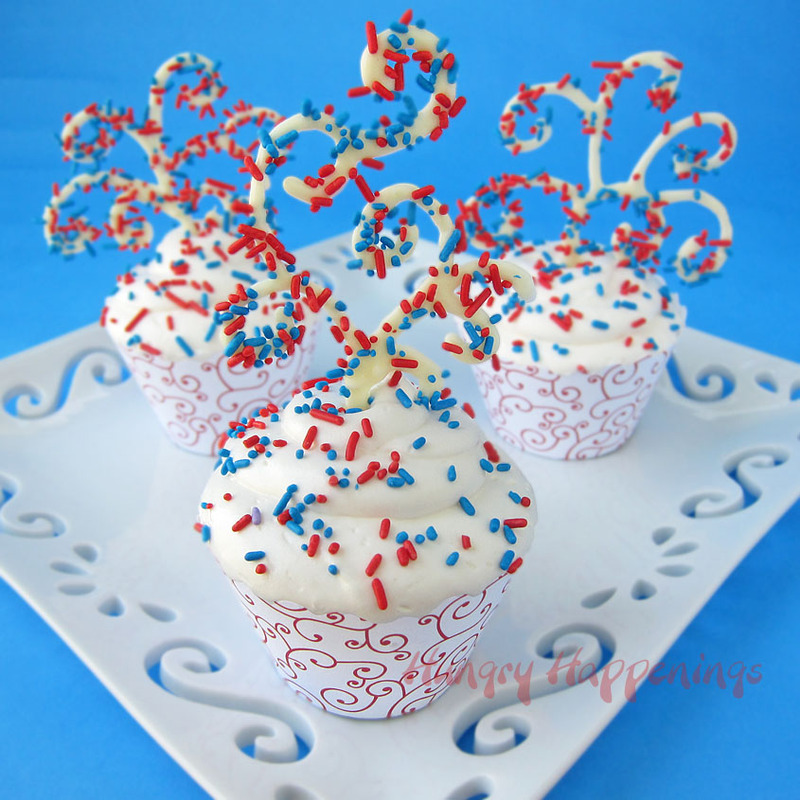 These scrumptious cupcakes are moist, sugary, eye popping, and beautiful! It’s always such an honor to be asked to participate in a blog party along with incredibly talented bloggers, and I love taking on whatever challenge is thrown my way. So, when, Carrie from Bella Cupcake Couture and Betsy from Java Cupcake invited me to join in the fun, I jumped at the chance. To make my cupcake design coordinate with my cupcake wrappers and the blog party theme, I chose my favorite decorating medium, chocolate. 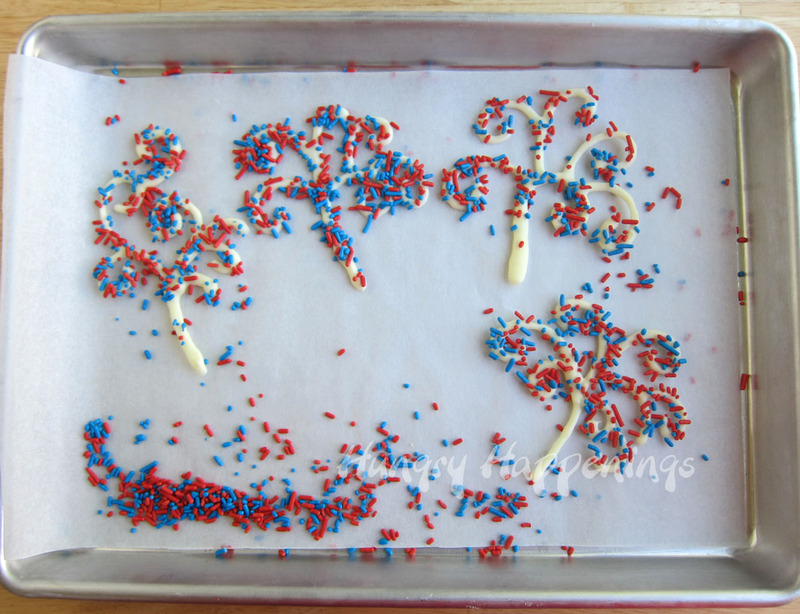 In this case, I used white chocolate to pipe swirly cupcake toppers which where sprinkled with red and blue jimmies to give the illusion of flying sprinkles. 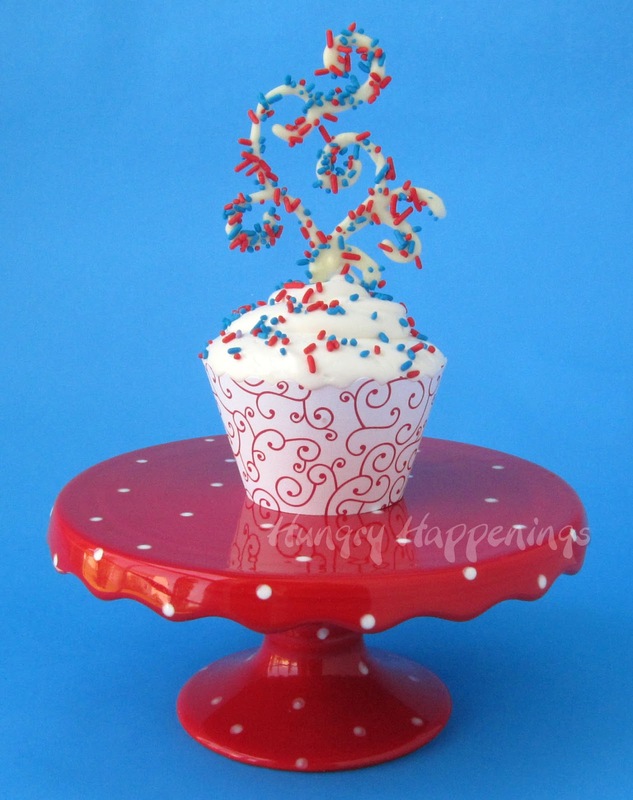 These toppers are super easy to create and will add a touch of whimsy to your Fourth of July festivities. 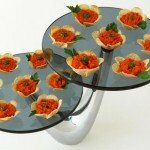 To display my cupcakes, I created a simple display using a plate that just happened to match my cupcake wrapper. I’ll admit, aside from my elaborate Halloween displays, I don’t go overboard when creating a place to serve my treats. I just grab whatever I can find in my cupboards, and work with it. The food should be star of the show, so using a plain background paper and a simple plate, is enough to show off these festive cupcakes. Pipe out swirls, like those pictured above. 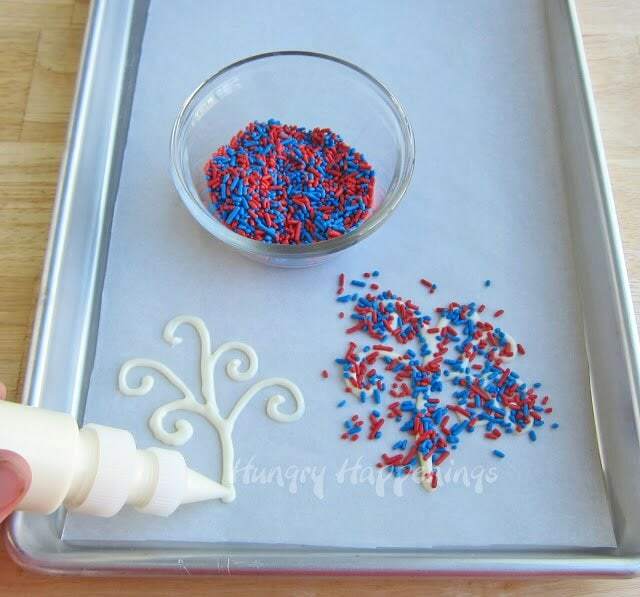 Immediately pour some red and blue sprinkles over top of the white chocolate swirls. 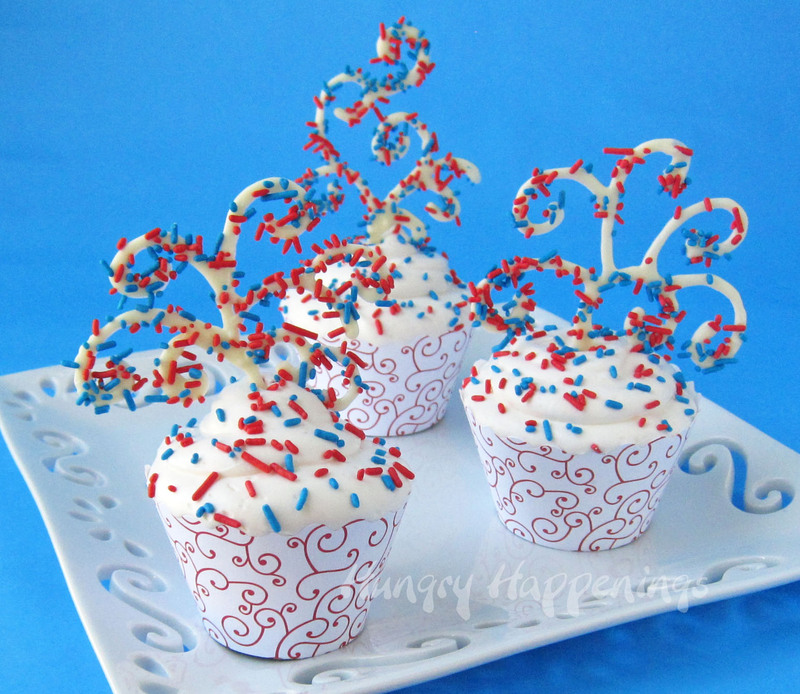 Repeat, creating more than enough swirls to top your cupcakes. Believe me, some will break as you are working with them. Refrigerate for a few minutes, just long enough for the white chocolate to set. Wrap your cupcake wrappers around the cupcakes. Pipe frosting onto cupcakes. Sprinkle red and blue jimmies over frosting. Place one sprinkle covered swirl in the center of each cupcake. 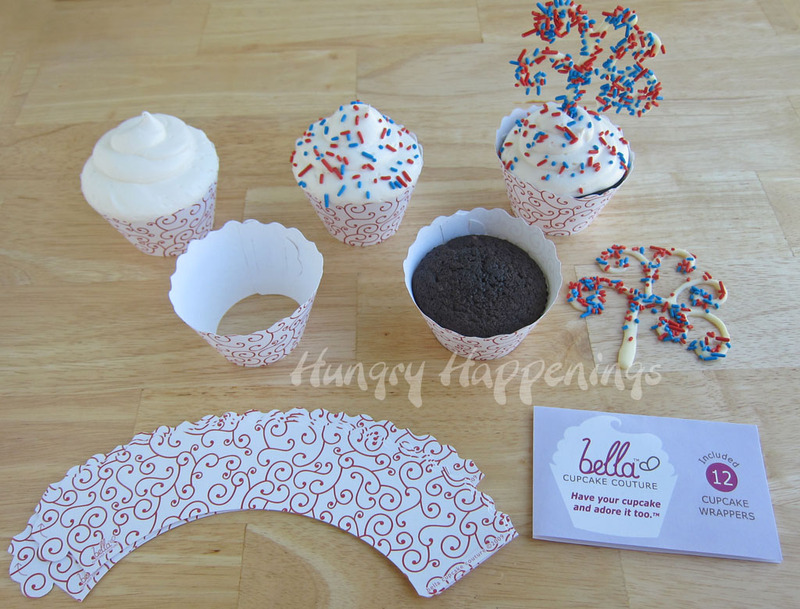 You can make the cupcake toppers up to a month before your party, then the day of the party, add them to the tops of your frosted cupcakes.As I mentioned, this post is part of a blog party and giveaway. 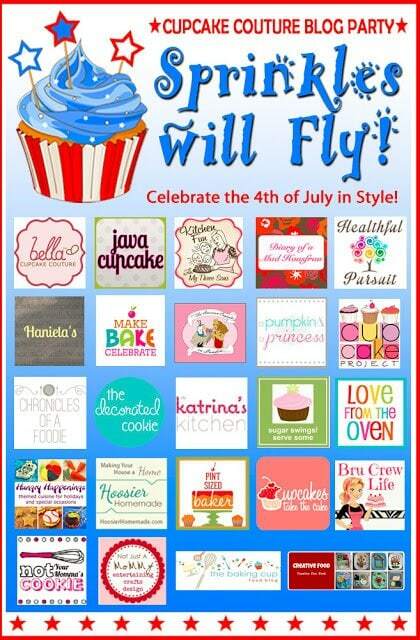 The amazing bloggers listed below all participated and created unique 4th of July cupcakes. Be sure to stop by and check out their creations. Awesome cupcakes! I love the fireworks, great use of the sprinkles. Oh my gosh! Your fireworks look like the wrappers! So super cute!!!! It was so easy to replicate the pattern on the wrapper. I love the design. Thanks for including me in your party. Thanks, Jennifer. I found it was super easy to duplicate the swirl pattern and was happy with how they turned out. 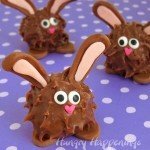 Theses are so fun Beth…love them!! 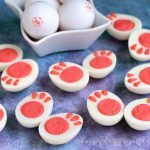 Those are the cutest cupcake toppers! I love how they are flying over the cupcakes!!! Oh, I'm so glad it looks like they are flying!!! Thanks, Jocelyn. I love the Olivia Swirl in Navy Blue! Those are so clever! 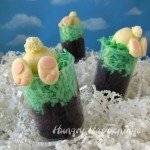 I love working with candy melts, but I never thought to make them into toppers! Girl, it seems like we are always on the same track! 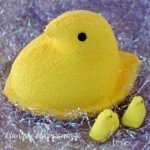 These candy melt toppers were my original plan then I changed my mind at the last minute. 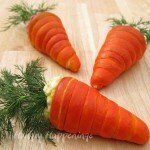 You did a FANTASTIC job on them, they are great! Can't wait to try them out sometime. you did indeed succeed!! love these beth! I love the Patriotic Stars and Stripes wrappers. Beth you really captured "Flying Sprinkles"! 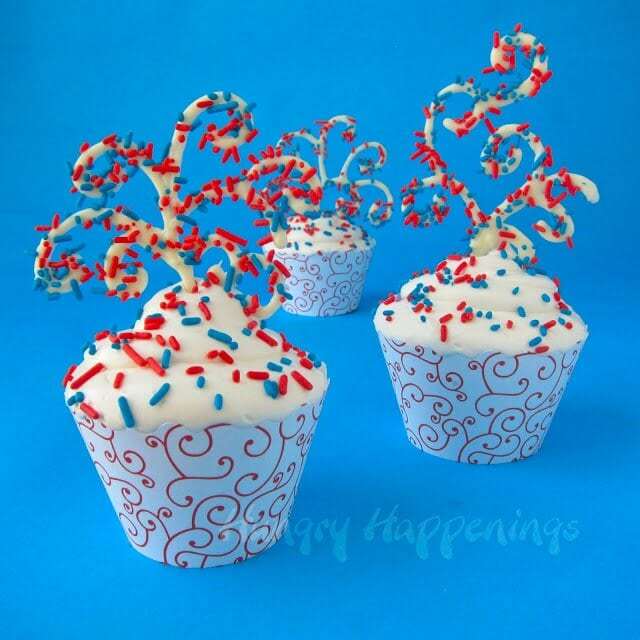 Such a fun festive cupcake! 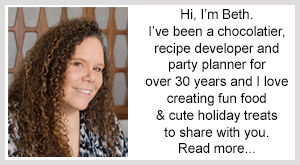 Wow Beth – your cupcake is sparkling with cuteness! I love how you carried out the theme of the wrapper right onto the cupcake! The Olivia Swirl wrappers in navy are very cute too. Love your challenge design! You did achieve your goal with the flying sprinkles! And you are right – the plain background really makes your cupcakes stand out! 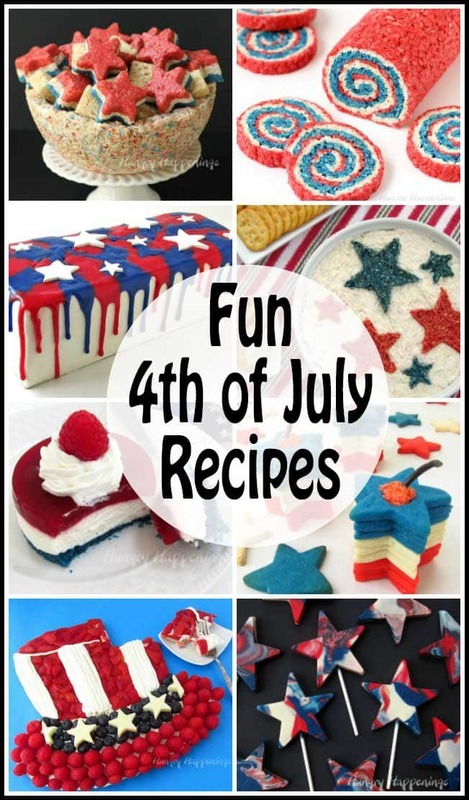 My favorite cupcake wrapper is the dark blue one – I think it would balance any toppings that are red and white – the easiest colors to work with. I love those flying sprinkles toppers. Brilliant!